Singles’ Day also known as ‘bare sticks holiday’ was once a celebration for China’s lonesome individuals. It was founded by Nanjing University students in 1993, to repudiate the pressure to be in a relationship. Throughout the years it has turned into an event that replicates Black Friday and Cyber Monday, however, it exceeds their sales combined. 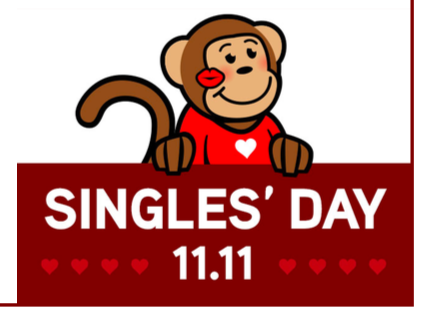 Each year Singles’ Day is celebrated on November 11th, 11:11, which was chosen as it resembles four solitary bare sticks. It has evolved from a day to celebrate singles to a day full of shopping with the ultimate sales. The annual event kicks off at midnight and runs for 24 hours. Single’s Day is considered the world’s biggest online shopping day of the year. Last year Chinese shoppers spent $25.3 billion in 24 hours. • Alibaba: The retail giant owns online marketplace Taobao, which has seen off competition from Amazon and Google to compete. • Tencent: Owns the QQ web portal and WeChat, the country’s most popular messaging app. • Didi Chuxing: The dominant taxi-hailing app has been backed by Apple, Alibaba and Tencent. • Weibo: Chinese for “microblog”, it is the country’s dominant social network, a cross between Facebook and Twitter. There are several ways to celebrate Singles’ Day. Many Chinese cities now hold matchmaking events, such as, speed-dating or “marriage markets”, where name-cards listing eligible bachelors’ names, ages, and often salaries, are publicly displayed on a literal wall of profiles.